Astronaut Harrison Schmitt, taking samples on the moon, is covered in lunar dirt. 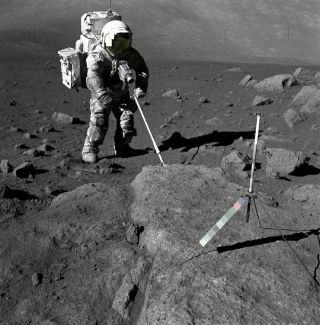 In this historic photo from the U.S. space agency, Geologist-Astronaut Harrison Schmitt, Apollo 17 lunar module pilot, uses an adjustable sampling scoop to retrieve lunar samples during the second extravehicular activity (EVA-2), at Station 5 at the Taurus- Littrow landing site on Dec. 12. 1972. The cohesive nature of the lunar soil is born out by the "dirty" appearance of Schmitt's space suit. A gnomon is atop the large rock in the foreground. The gnomon is a stadia rod mounted on a tripod, and serves as an indicator of the gravitational vector and provides accurate vertical reference and calibrated length for determining size and position of objects in near-field photographs. The color scale of blue, orange and green is used to accurately determine color for photography. The rod of it is 18 inches long. The scoop Dr. Schmitt is using is 11 3/4 inches long and is attached to a tool extension which adds a potential 30 inches of length to the scoop. The pan portion, blocked in this view, has a flat bottom, flanged on both sides with a partial cover on the top. It is used to retrieve sand, dust and lunar samples too small for the tongs. The pan and the adjusting mechanism are made of stainless steel and the handle is made of aluminum.